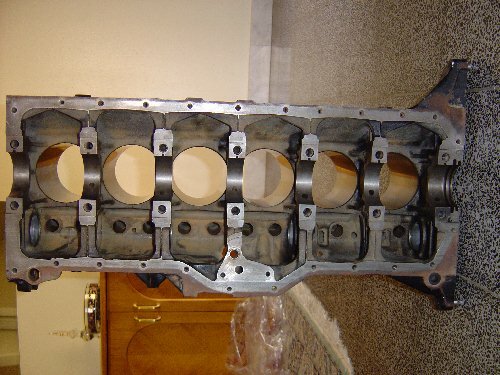 *Cost of '95 junkyard head with valves that I bought, DIY ported, and bolted onto my old 4.0L engine last year (includes hot tank, milling of head surface, and Standard Abrasives head porting kit). I was left with my original '92 head and valves as spare parts. I ported this head and used it for the stroker build-up. It cost me $1573 to build a complete stroker long block from scratch and I recouped $602 by selling my spare old 4.0L long block, so total outlay was effectively $971. If I'd reused the stock '00 camshaft, '00 camshaft sprocket, and stock valve springs/retainers/locks to build a "poor man's" stroker instead of adding performance items, my total outlay would have been $290 less at just $681. Block viewed from below. The '00 4.0 block has seven main bearings and uses a main bearing stud girdle to add rigidity and reduce NVH. 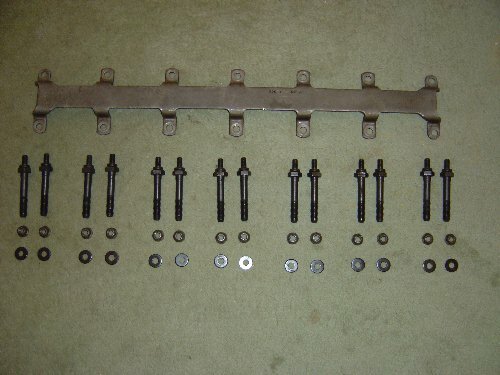 The main bearing caps are bolted to the block with studs that have extensions onto which the girdle slides into place. The girdle is secured with nuts that go onto the main cap stud extensions. The pads on each side of the stroker crankshaft's no.2 and no.5 rod journals interfere with the girdle, so the girdle has to be elevated by using 5/16" hardened steel washers as spacers to provide the necessary clearance. '99-'04 4.0 blocks have casting no. 53010449AA. 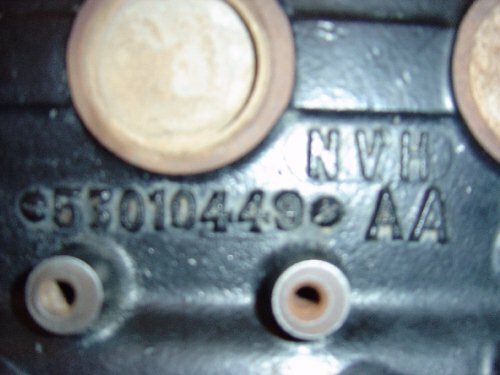 The NVH stamp signifies that the block has the noise, vibration, and harshness fixes that Daimler-Chrysler introduced in '96.